With the election looming, Michael Howard cannot be pleased at his constant depiction by cartoonists and wits as a blood-sucking vampire. But never, even during his darkest days as home secretary, did he suffer the indignity recently visited on Rhodri Morgan of being mistaken for a Doctor Who villain. The Welsh assembly's first minister arrived at the BBC Wales studios for the political programme Dragon's Eye at the same time as a group of Doctor Who actors, and staff mistook him for an actor playing a treelike monster — though his fluffy grey hair more resembles a mature dandelion. The minister, who writes in today's Guardian of his joy at Wales' grand slam rugby victory on Saturday, was taken for one of the followers of the Doctor's new enemy, Jabe. His spokesman said yesterday: "They were filming Doctor Who at the time and there were loads of extras at the BBC Wales studios. A meet-and-greet guy from London obviously did not recognise him. "A young make-up artist then came in and said to Rhodri, 'Oh, are you one of the trees?' Rhodri then twigged and had a good chuckle about it. He thought it was really funny." The Time Lord returns to the small screen this weekend after more than 16 years for a new series written by Russell Davies, of Queer as Folk, and the team from The League of Gentlemen. The Doctor, played by Christopher Eccleston, faces the return of his previous enemies the Daleks. There is no word on whether the onetime secretary of state for Wales John Redwood, who was once compared to a Vulcan, will be making an appearance. APA 6th ed. : Yafai, Faisal al (2005-03-21). Rhodri Who? Minister mistaken for alien. The Guardian . MLA 7th ed. : Yafai, Faisal al. "Rhodri Who? 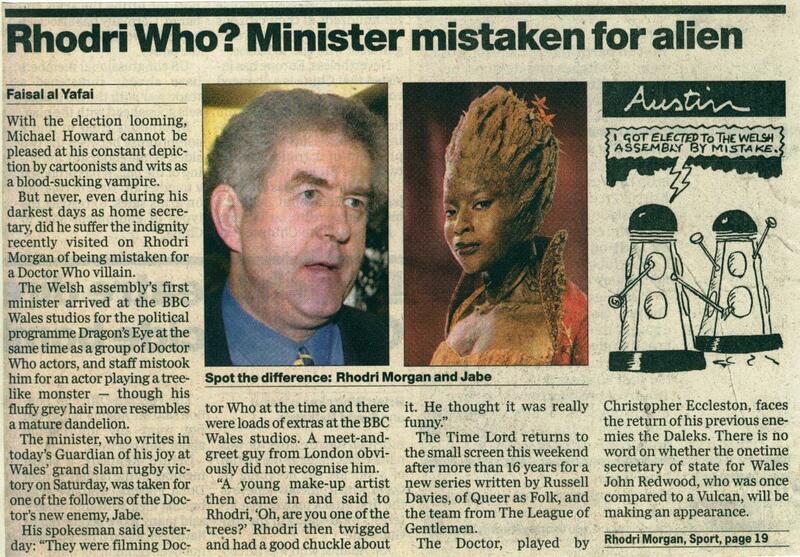 Minister mistaken for alien." The Guardian [add city] 2005-03-21. Print. Turabian: Yafai, Faisal al. "Rhodri Who? Minister mistaken for alien." The Guardian, 2005-03-21, section, edition. This page was last modified on 6 July 2016, at 00:42.